· Fashion Notes: If I didn't make jewelry, I would buy it here. ...it wasn't the norm to make earring frames. Standard practice was to buy readymade frames, attach stones and call it a day. Lately however there's been a bit of innovation in handmade earring frames. I was scrolling through Etsy last night, looking for ideas for spiral earrings, since I had it in mind to make some. Part of the fun here is "How did she do it?" but I'm seeing a lot of square wire, with fine-gauge wire "soldering" the pieces together. Really dig her combination of herringbone weave and beaded bezel techniques to frame the black garnets. These examples have a slightly more rustic flavor (though she has pieces on the site which defy gravity). 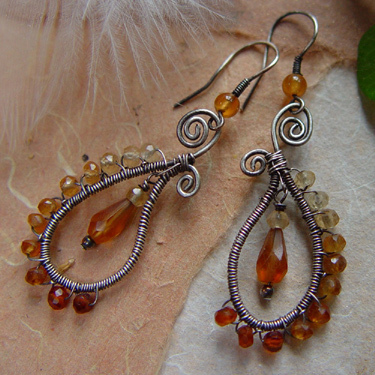 I love how she used graduated shades of hessonite to produce a vivid, yet also subtle, line of color. 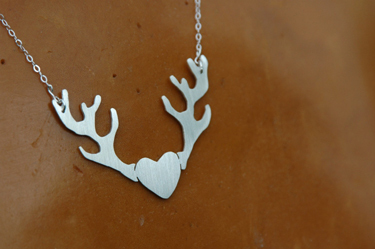 Got a bit sidetracked here, but what a killer heart pendant. She has hammered skull earrings breathing fresh air into the skull motif, a ship necklace, and much more. Mind you, I'm not going to duplicate these exactly. But they are the perfect spiral, balanced off by longer "stems." How do you wear those last ones? 'Cause those are pretty sweet looking! 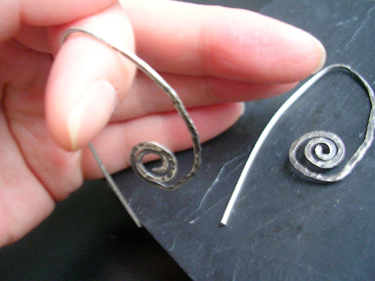 I just made a pair based on this spiral, though they're quite different from Natsuko's. I didn't oxidize them, so they don't have that blackened look (it's not hard to oxidize silver, you can use a hard-boiled egg to darken it, then you can use silver polish to brighten the areas you want to highlight). Mine are hammered but not chased, so they're flat and shiny in places, and hard (hammering hardens wire) but not textured. You just take the straight side and put it in your ear lobe. 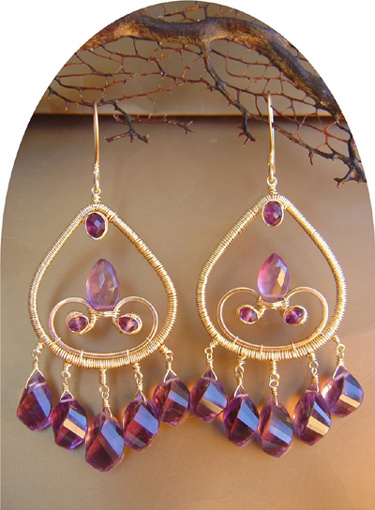 The stem balances the spiral so the earrings hang straight rather than leaning forward. 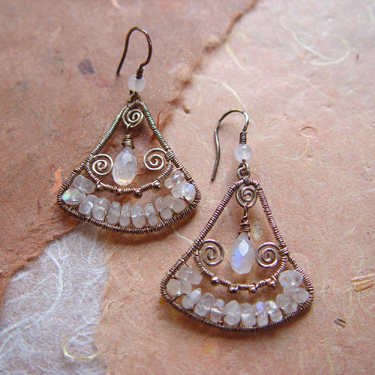 I put three little moonstones on mine...my daughter did some of the wrapped wire on a couple of them. I had to laugh when she did it, because it took me years to do a good wrapped loop. Fashion Notes: If I didn't make jewelry, I would buy it here. 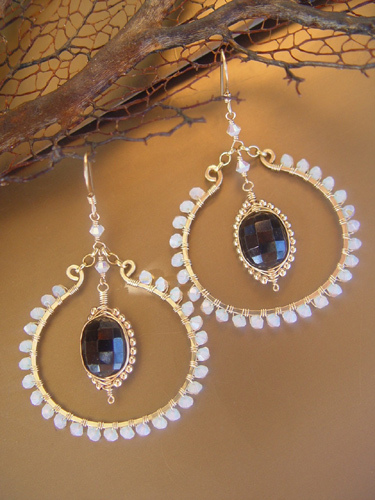 It takes two to three years to make jewelry, even from a non-metalsmithing perspective. Sounds like a trifling period, but you need dedication to start from nothing and continue on for upwards of three years. After the first two years, you undergo a transformation. No longer are materials and methods an issue. You know exactly what to use--which temper and gauge of wire, where to buy it, how much to buy, what tools to use, what techniques to employ. Now it is far more a matter of what you wish to convey, which is a variation on the concept of design. Mass-produced jewelry tends to be all about selling a pretty design, and I'm not knocking it, but handmade jewelry tends to be one-of-a-kind and far more intellectually conceived. It's also an easy way to buy American. The best form of charity, after all, is not charitable: you give someone the opportunity to work, to produce. Our decline in major production...the United States was once at the forefront of manufacturing...has spawned cottage industries such as jewelry-making, independent clothing houses, perfumery, and so forth, at an ever-increasing level of quality. So if you're looking for baubles this year, you might try some of these sites first. I first encountered the hands, heart and soul of Ava Luxe when I tried some of her perfume oils. I had mentioned a copy of Chanel No. 5, which I love but am allergic to, and was amazed she had replicated it perfectly. Another scent I loved was Ingenue, a resurrection of the long-discontinued Deneuve fragrance (yes, Catherine Deneuve once had a celebrity scent). Ava Luxe was on sabbatical recently; a small selection of the perfumes are available now on the Etsy site. Her recently-added jewelry really strikes me though, as having jumped forward into that intimate, almost spiritual zone. The Golden Lotus Necklace ($99) just looks sweet, from its long-and-short golden chain to its (Hill Tribe?) 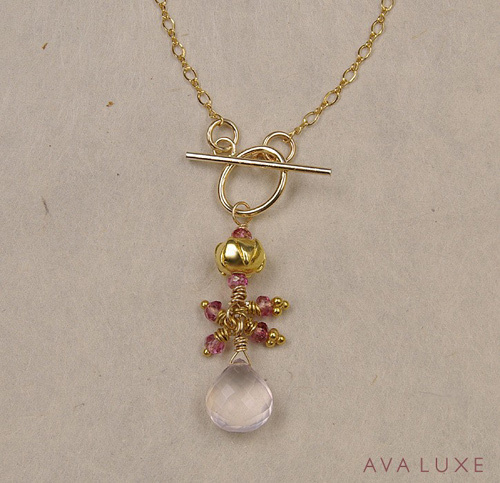 vermeil lotus bead, delicate pink topaz accents and limpid rose quartz drop. There's more, of course, from a wicked good pair of fine silver earrings to an ethereal elf bracelet and beyond. Midori Jewelry is my personal jewelry-making hero. There is a quality of peace in her pieces, a languor, a leisure in her careful selection of exactly what to put in each. I feel Midori Jewelry has been widely copied (in fact I borrowed one of her handmade hoop designs, it was so good) yet there's nothing quite like the original. 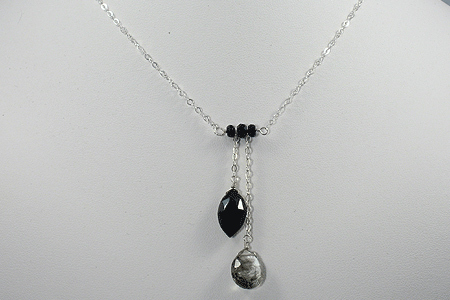 I love the Hecate necklace ($70); it's sheer genius. You get the look of a lariat, without the annoying strangly or loose feeling. 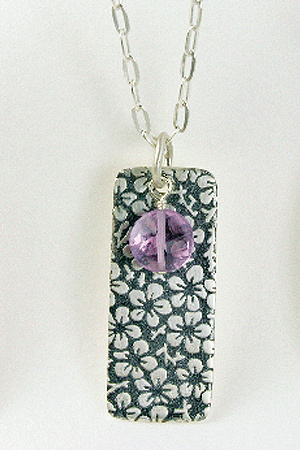 The Plum Blossoms necklace ($70), with its hand-etched sterling silver dog tag pendant, bequeaths a gentle touch of Spring to your mood. There are several "water" pieces on the site that are truly lovely as well. Sky Dreams' pieces are opulent and gem-oriented (she also has a "Sky Dreams Light" site on Etsy for less expensive jewelry). 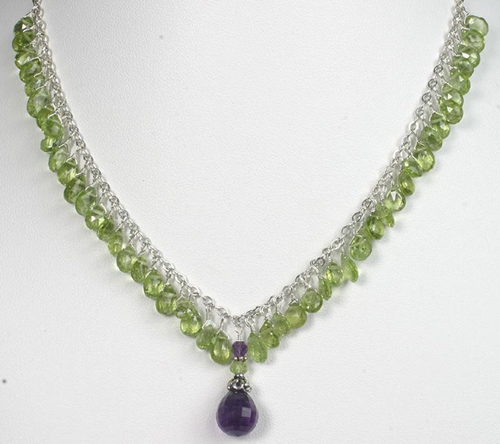 This Peridot, Amethyst Sterling Silver Necklace ($159) is not something I'd normally consider. It's, well, a whole lot o' gems, but its thoughtfully-chosen spring green color, popped by purple, of all things...it works. It makes me think of a lush green meadow with a touch of violets. There's a close-up of the wrapping detail on the site; each green briolette has been worked into the chain by hand.